An exclusive "Docu-Blog" of personal reflections,experiences, OPINION and precious memories including hundreds of letters, emails, phone calls and photos following an intimate accidental dynamic relationship with BOP Federal Inmate #84888-054, Former NYPD Commissioner and Felon on Probation, Bernard B. Kerik. Please see below-captioned TERMS AND CONDITION OF USE. This blog and its consortium of contributors are not associated with felon Bernard Kerik. 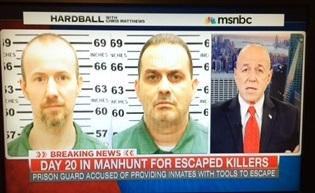 Felon, former corrupt cop and former inmate, Bernard Kerik, was seen on "Hardball", flapping his libel-proof gums masquerading as a Corrections "expert" throwing around the most laughingly hypocritical terms such "in the guidelines of the law"! I know, right? I was captivated by the irony of this television moment as I reflect upon the last five years of my life. As I have explained in this very blog, I supported, financially, emotionally, Federal Inmate #84888-054 Bernard Kerik. I had almost daily contact in emails, phone calls and hand-written, letters with Bernie as we collaborated in co-authors on our new book, "From Jailer to Jailed". I know, first-hand, how a prisoner can manipulate well-meaning, unsuspecting innocents and embroil them into their web of deceit and lies. Inmate Bernard Kerik manipulated me out of $93000.00 right from inside his prison walls, continuing his master manipulation, intimidation and threats seemingly with the full knowledge and blessing of the US Bureau of Prisons as well as the US Probation Office. In recent days I have been asked by more than one person, "How did a smart woman like you get caught up with a creep criminal like him?" Well, It is a subtle and gradual grooming, much in the same way child molesters get close to their young victims. Bernie had the smooth swag to make me feel as I was one of the most important persons in his inner circle. He would even profess that in emails and letters. Inmate Kerik manipulated money from me by saying it would "help his family" because that would mean more for his suffering young daughters, Angelina and Celine. Little did I know as I was dropping benjamins in his commissary account, he was perhaps pulling the same crap with one or more unsuspecting women (stay tuned). Oh and don't worry about Bernie's kids. They are still living in the $2million estate and attending private school. Go figure, right? Bernie didn't limit his manipulation to civilians. He also put the sway to work on guards and other prison officials. I account in this blog Bernard Kerik was allowed to use the private phone of a Federal BOP official to make several personal phone calls when Bernie was being transported back to Cumberland FPC from MCC New York City after his alleged "solitary confinement" of special meals and other "special" treatment. I know because one of these prohibited phone calls was to me. To the best of my knowledge, no BOP official has been punished over this flagrant violation. Bernie and friends are even allowed to threaten, harass and intimidate me to this day with full knowledge and blessing of the US Probation officials who are charged with "supervising" Bernie's lingering federal probation. They are the same officials who think a felon on probation who owes over $180,000 criminal restitution can write a book, get paid for appearances, start a dark money funneling .org and still only qualify to pay $250.00 per month. (I'm still waiting for someone to explain all that to me). So you think the Clinton Correctional follies are still shocking? Read on. Inmate and Federal Probationer, Bernard Kerik, also manipulated me out of the co-authorship rights to my three years' writing and work product in what is now published as our new book, "From Jailer to Jailed". I collaborated with Bernie writing/editing daily, discussed the book on visits, in emails and planned its content, talking points and ideas. As soon as Bernard Kerik was free, he demanded my original documents then promptly published with full knowledge and conspiring with his book agent all without my permission, consent or compensation. Bernie perpetrated this in his professional and personal life as well. He cheated on his wife, Hala Kerik, for years with not one women, Judith Regan, overlooking the smouldering ash of his own police officers on 9/11 but two simultaneous adulterous affairs! One of those affairs was reportedly during those "midnight rounds" at Rikers with his subordinate Correction Officer, Jeanette Pinero! Yes, good times. We might forget them as "former Corrections Commissioner Bernard Kerik" Monday Morning quarterbacks Rikers on his whining television tour! So why do we appear so shocked with the shenanigans of Clinton Correctional being exposed? Bernie Kerik's life is a series of "quid pro quo", saying it enough to make it appear true, copying off the smart guys paper with a genius pension for "magical thinking". He's done it his entire life in my personal experience and examination. No, Richard Matt and David Sweat have nothing on Bernie when it comes to manipulating innocents for all they can take. Bernie just has better suits and higher class of conspirators and cronies. That's just what true crooks and bad guys do. Share book reviews and ratings with DoingTimeWithBernie, and even join a book club on Goodreads. I have no connection to this charity except that I am a loyal donor. I honor the hard work they do for children. If you consider a donation tell them www.DoingTimeWithBernie.com sent you! Terms and Conditions of Use: All content provided on this www.DoingTimeWithBernie.com is for informational puposes only. The consortium of owners of this blog make no representations as to the accuracy or completeness of any information on this site or found by following any link of this site. The consortium of owners of www.DoingTimeWithBernie.com will not be liable for any erros or omissions in this information nor for the availablitliy of this information. The owners will not be liable for any losses, injuries, or damages from the display or use of this information. This terms and conditions is subject to change at anytime with or without notice. DoingTimeWithBernie.com US Trademark and Copyright All Rights Reserved 2016. Awesome Inc. theme. Powered by Blogger.